I know many fans (myself included) like to attend Senators games even when they are on the road. Here’s a handy dandy guide to the ten best promotions and giveaways you can catch as you plan your road trips throughout the season. Bring your dog to the ballpark as the Baysox take a ride in the Mystery Machine with Fred, Daphne, Velma, and Shaggy. This would have been even better if they scheduled the next day’s Dollar Dog Night here as well. The annual festival features some of the most popular craft beers hailing from Berks County and its surrounding areas along with an all-you-can-eat buffet that lasts two hours prior to game time. A celebration of some of the greatest game shows in television history like The Price is Right, Wheel of Fortune, and many others. Perfect for every Pirates fan…just like El Toro, I guarantee you’ll hate it on your desk for three weeks out of the month. This promo will be a failure on so many levels if they don’t play the “Get him a body bag!” clip after every strikeout. Break out your grungy plaid shirt, MC Hammer parachute pants, and butterfly clips as the Rock Cats wrap up their trips through the decades. The former WWE Champion and Hall of Famer comes to The Flagship City for a VIP meet & greet and one-hour autograph session. As a kid, I attended so many games at then Reading Municipal Stadium it was like a home away from home for me. I have a spot reserved for this giveaway on my desk next to the Metro Bank Park replica. Akron native and lead singer of The Pretenders gets her own bobblehead in a series that honors noteworthy musicians from the area including Devo, Joe Walsh, and The Black Keys as well. 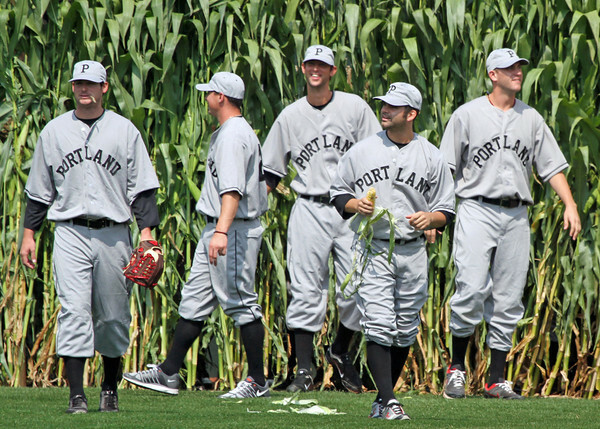 Possibly the best promotion in all of minor league baseball, Portland’s annual Field of Dreams game is a sight to see. In a scene out of the classic movie, players emerge from a cornfield in center field wearing replica 1926 Portland Eskimo uniforms before they enter the stands to personally thank fans for their support throughout the season. This entry was posted in Uncategorized and tagged 90's Themed Night, Beer Tasting Festival, Chrissie Hynde bobblehead, Field of Dreams, FirstEnergy Stadium Replica, Game Show Night, Harrisburg Senators, Mutt Monday, Pedro Alvarez bobblehead, Portland Sea Dogs, promotions, Scooby Doo, Sgt. Slaughter, The Karate Kid. Bookmark the permalink.